In 2005, the Dutch NOS broadcast a repeat of the 1980 Eurovision Song Contest, owing to the fact that it was the last contest to be held in the Netherlands -25 years earlier. It was very interesting to see this old contest a day before the new one (the 2005 edition) was held. Of course everyone remembers the winner (Johnny Logan with 'What's another year'), but many songs were long forgotten. 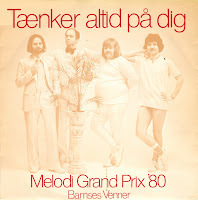 Among them, this Danish entry by Bamses Venner. It finished 14th out of 19 contestants - and a lot of it has to be down to the presentation of this group. They seemed to have been pulled from the street. The song itself was nice enough, so when I was in Denmark and I spotted this single, I jumped at the opportunity to own it. And it was cheap, too.